Andrew Zappavigna and Carlo Pellizzari in a pre-test photograph. Their entry went on to win this year's contest and to place in the top five of "all time." 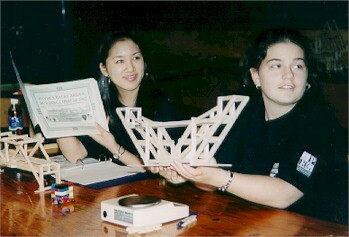 Most students are happy to build a bridge that supports 50 kg. This entry supported more than three times that figure. 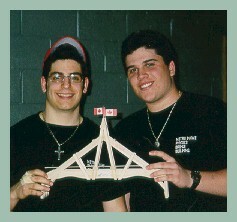 155.5 kg is a very impressive result indeed for a 100-gram bridge. 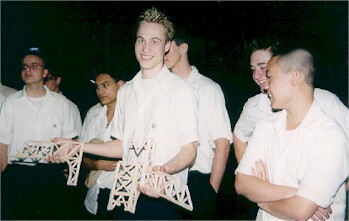 The testing crew readies the bridge and testing apparatus. Chief testers Matthew Paone and Matthew DiTomaso helped make this year's contest one of the smoothest. Before a bridge can be tested it has to pass these tough judges. Chrystal Ho and Sabrina Grossi worked throughout the event, grilling competitors on their construction materials and ensuring that contest rules were met. Chrystal's own entry placed second. Sabrina's entry received an honorable mention in the workmanship/design category. Joey Uljevic proves that there can be happiness after bridge destruction, even if the bridge only just squeezed by the 20 kg "minimum" mass supported figure. 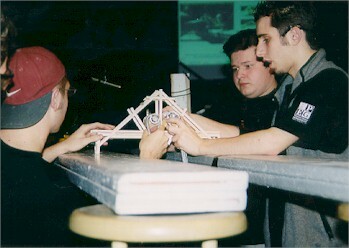 From left to right, Chris Switzer, Mike Adamski and Matthew DiTomaso, along with Matthew Paone just visible at the left, carefully attach testing apparatus cables to the bolts protruding from the test frame. A steady hand and attention to detail in this phase of the testing help ensure a fair competition for all entrants. 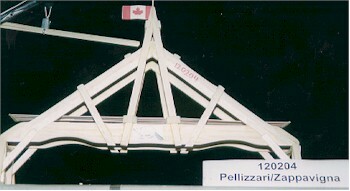 Another shot of this year's winning bridge. The beam in the upper left is not part of the structure. 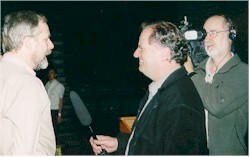 BCTV's Mike McCardell dropped by the contest this year. His delightful segment ran during that evening's News Hour.